Sweet corn sundal is a very easy and super tasty sundal recipe & this must be kids most favourite among all the navratri sundal recipes.But most of us don’t do it just thinking about its difficulty in removing the kernels from the boiled corn.Many of us use frozen corn & microwave it to make our job simple.But u can easily remove corn kernels from fresh corn too.Last year i found this simple & quickest way to remove corn kernels from a road side corn wala.With this method,making corn based recipes has become a breeze for me.To make you feel the same,i have shared that easy method with stepwise pictures,just go thro it and make this sundal instantly.Actually I wanted to post this sweet corn sundal recipe during last year Navratri but i couldn’t.So this year,as an interesting addition,i have shared two versions here.One is sweet corn spicy sundal(the normal one) and the other one is sweet corn sweet sundal.I hope this sweet version may be new to some of you.As spicy sweet corn sundal is common and well known to everyone,i wanted to try a sweet version with it.I just followed my Green gram sweet sundal & karamani sweet sundal recipes and prepared it.It was very nice n I loved it a lot.Basically i love the combination of sweet n spice.So i tempered this sweet sundal with a red chilli for mild spiciness and it lend a nice flavour to it.Do try this sweet sundal version.U may love it like me .The second version is a very simple one like other sundal recipes.To make it more colorful n healthy for kids,u can add grated carrot and green peas.It will be more appealing to the kids and they will sure love it.U can try this sundal with American sweet corn or Indian corn.Tastes good for both.Ok,lets see how to make this sweet corn sweet sundal and kara sundal . Do check out my Colorful Rangoli sundal too ! 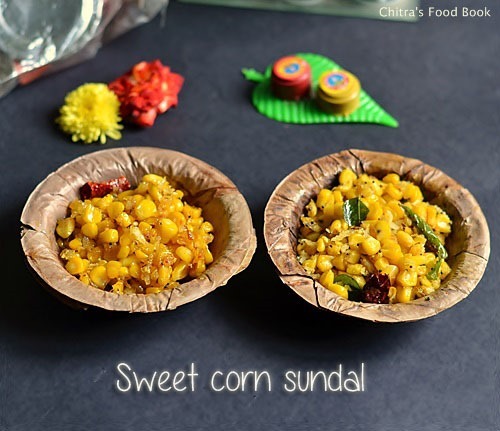 Sweet corn sundal recipe for Navratri naivedyam ! Peel the corn and wash it.Cut into two pieces and pressure cook it adding enough water.Remove n let it cool. Take a piece of corn in a plate and hold it straight.Run your knife from top to bottom by cutting the kernels. Collect the kernels in the plate.Separate it and keep it ready.U can refrigerate in a zip lock bag till use..
For sweet sundal,melt grated jaggery adding enough water to cover it.Strain the syrup and collect in a bowl.Add cardamom powder and set aside.Heat oil in a kadai and temper all the ingredients given above. Add the sweet corn and jaggery syrup.Mix well till the syrup is absorbed.Lastly add grated coconut and mix well. For spicy sundal,heat oil in a kadai and temper all the ingredients given above.Add the boiled corn kernels and mix well.Add salt,grated coconut n lemon juice.Mix well and switch off the flame immediately. For sweet version,u can replace jaggery with sugar.Adjust the quantity of jaggery based on the sweetness u like. Love to have a bowl of this sweet corn sundal. I would definitely want to try out the sweet version, Happy Navrati to u Chitra..
Sweet corn sundal looks great!!! Lovely photography!! I am happy to follow your blog. Do visit my blog sometime and share your thoughts! !